In our efforts to avoid conflict, we often weigh risks that impact how and what we learn. 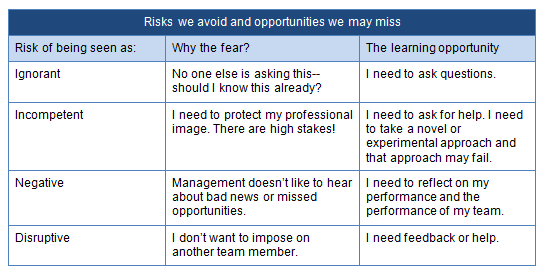 Sometimes a fear of risks can keep us from being our most productive. We may avoid risks that we actually should take. Edmonson (2008) says that an atmosphere of psychological safety can help teams to take risks while minimizing negative conflict (not all conflict is bad after all). Psychological safety, in turn, is impacted by the level of trust in a team—”When there is a low level of trust in a group, contributions of group members are limited to achieving personal rather than cooperative goals” (Edmonson, citing Dirks, 1999, p. 18). A clear vision of cooperative goals is a powerful motivating force that impacts perceptions of psychological safety and trust. A good team leader makes these goals transparent from the start. But you don’t have to be an “official” leader to help lead your team. If you don’t see clear goals, ask about the mission. Sometimes, when a team’s in crisis management mode, team members haven’t taken a pause to think about this. Consider the dancing guy–we can learn from him.